David Murphy and Adam Rossington hit hundreds as Northants battled hard to secure a draw in the final match of the season, at Surrey. 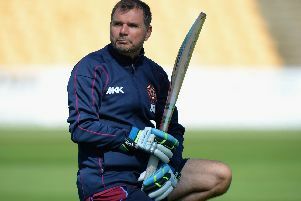 David Ripley’s men, who have finished fifth in County Championship Division Two, were worried by a late Jason Roy onslaught. The England one-day batsman, who had earlier signed a new deal with the club, smashed 70 off just 35 balls as Surrey threatened to chase down 215 in 33 overs to claim a ninth win of the season, but a draw was agreed soon after he holed out. It was the two wicketkeeper batsmen, Murphy and Rossington, who starred however, hitting career-best centuries to help the visitors – who had followed on 300 in arrears – to a season’s best of 514 all out. Having been set what seemed to be a notional target, Surrey made a bad start when Steve Davies suffered a first-ball duck after Muhammad Azharullah slipped one through his defences to peg back off and middle stumps. Kumar Sagakkara’s attempted uppercut against Maurice Chambers picked out the fielder at third man, Rory Burns shimmied and missed to be bowled by Graeme White and Arun Harinath was bowled around his legs when attempting a reverse sweep. After auctioning off his autographed jockstrap for charity during the tea break, Roy sidled in to hit a lusty half-century to provide some late entertainment for the crowd who had gathered to see the title claimed. The sides duly shook hands on a draw at 5pm with Surrey still 90 short of their target but with only five wickets and 17 overs remaining, with with enough points to celebrate first place. At the start of the day Northants, resuming on their overnight total of 223 for one and trailing still by 77 runs suffered in the face of yet more sibling rivalry between Surrey seam-bowlers Sam and Tom Curran. The brothers, having shared all 10 Northamptonshire wickets in the visitors’ first innings of 110, bagged three more in the space of 11 balls. Northants celebrated briefly when Ben Duckett steered Tom Curran’s first ball to the ropes at third man to reach his 1,000 first-class runs for the season milestone, before he fell for 120 and end a face-saving second-wicket stand with Alex Wakely that had added 227. Rob Keogh lasted only five deliveries before his rash cover drive against Sam Curran was comfortably taken by Ben Foakes, and Wakely went lbw playing across the line without adding to his overnight tally of 93. The chances of the Currans bagging all 20 Northants wickets were dashed when Gareth Batty had Josh Cobb caught off a looping bat-pad catch at short leg. Rossington dashed to 50 from 48 balls with 11 fours and, in tandem with Murphy, added 51 inside 13 overs before Rossington posted his first ton of the season off 88 balls in the over after lunch. Murphy, in what may transpire to be his final game for Northants, should have gone soon after when he nibbled one from Tom Curran into the cordon where Roy downed a regulation chance at second slip. Rossington’s fun ended after three hours when his forcing shot against Matthew Dunn grazed the inside edge to be caught by keeper Gary Wilson tumbling to his left, before Graeme White, Azharullah, and Chambers fell cheaply, leaving Rory Kleinveldt - who injured his calf when bowling on day three - to hobble from the pavilion with Rob Keogh acting as his runner. Realising he had all but run out of partners, Murphy accelerated to reach his maiden first-class hundred and celebrated with both arms aloft, acknowledging the dressing room and his parents, who were sat outside the pavilion.